Recently, I mentioned my Stack Overflow reputation points to a potential employer, although I didn't send them the link to my profile yet. Apparently, two days ago, someone (I have no idea who or why) serial upvoted my posts, and yesterday it was reversed. Now my reputation points screen has a red, publicly-visible "serial upvoting reversed -80", and I think it makes the rest of my reputation points look suspect. Obviously, someone who did try to game the system would deserve the scarlet letter. I have no idea how to establish that I don't know anything about the serial upvoting -- I was in top 4% for quarter with over 400 reputation points before the upvoting, since creating this account less than a month ago (I abandoned my previous account when I was a beginner years ago), so I didn't need the 80 points. Is there any way to establish or just affirm that I don't know anything about the serial upvoting and have the red -80 not displayed? I know Stack Overflow is promoting using the site to show off to employers, and this makes me extremely reluctant to mention my Stack Overflow reputation points to a potential employer. EDIT: To be clear, I don't care about the number, don't want the points restored, and don't think it's "all" that potential employers look at on Stack Overflow. I am concerned someone browsing my profile will think the "serial upvoting reversed -80" is because I tried to juice my own score and got caught. This is what looks bad. As @Michael Geary notes, the "learn more" link leads to a page where it says the reversal is because of voting fraud, voting fraud is emboldened, yet in finer print it says that users are docked points after being victims of voting fraud -- a very counter-intuitive idea. Knowing users can be docked points due to other users' actions with which they had nothing to do is counter-intuitive and not at all automatic. EDIT 2: Added feature-request tag per BoltClock's suggestion, "Perhaps it [Serial upvoting reversed] should only be made visible to moderators and the user themselves. It's not like this information is useful to anyone else except for public shaming anyway." The linked Help Center page has also been revised with a more neutral tone. First off, if you're gonna send a link to your profile to a potential employer, make sure you tell 'em to read your posts. And if they don't, be very worried. No, not at all. It's only an indication of reputation change. After all, we can't control the actions of other users. It's very rare where we'd run across a user who was committing the voting fraud themselves on their own account, and in most instances of that, they will have already been dealt with accordingly. You should in no way be concerned with reversal statements in your reputation history. Granted, if your rep history is mostly reversals (and mostly not votes) then that would be pretty damning - I probably wouldn't be showing such a profile to most employers. But that's not the case for yours. If they implement BoltClock's suggestion that would solve the problem. Explain that the reversal is there because someone else did something they should not have. And you may also point out that it is possible for people to serial upvote someone else without realizing that this is what they are doing. Someone finds an answer that they like, click on the user profile, start reading other answers that they like and pretty soon they are serially voting. There's nothing evil going on here but the system sees it as undesirable. An employer who does not get this, or who will eliminate a candidate without knowing that serial voting means is probably not someone you want to work for. Not the answer you're looking for? 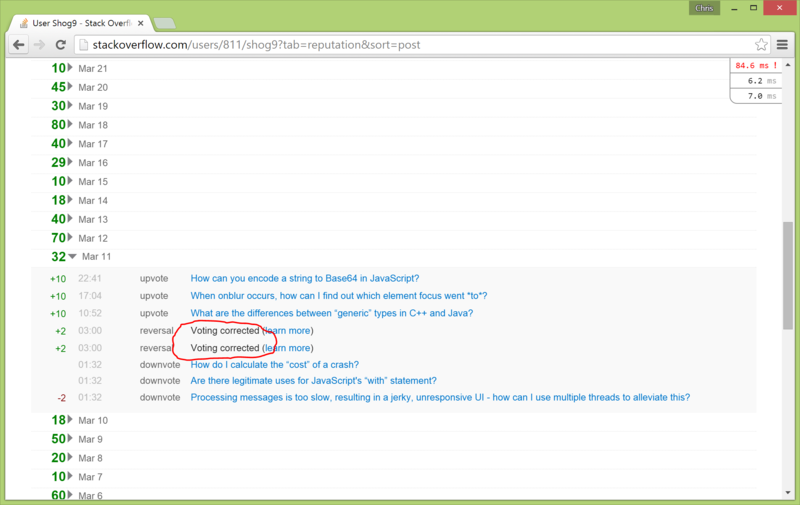 Browse other questions tagged feature-request status-completed serial-voting jobs reputation-history .